The Fargo Police Department strives to stay on the cutting edge of realistic, current law enforcement training. We have a rigorous entry training program followed by continual in-service training requirements and opportunities for our officers. Firearms Training: The new recruit attends a three-day firearms training and qualification course. This training is designed to familiarize the officer with their new duty equipment, holster and police sidearm. The Fargo Police Department issues all officers Glock model 22 or 23, .40 caliber pistols. The firearms training course starts with the basic principles of marksmanship. It then incorporates advanced firearms skills, high stress and combat firearms skills. Officers are taught low light and flashlight shooting techniques. 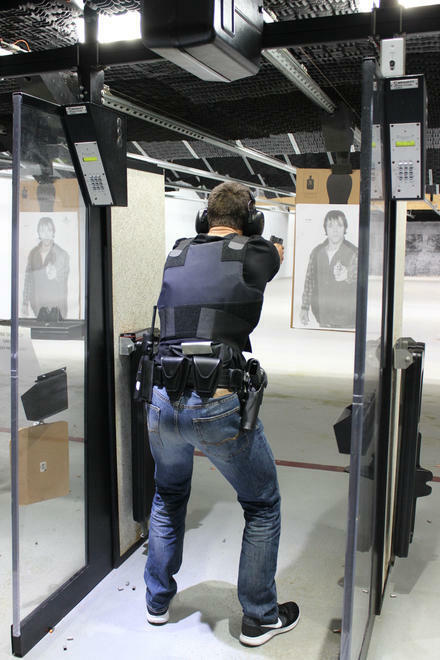 Safe handling and conduct with firearms while off duty is covered in a classroom and range setting. The firearms training culminates with the officer shooting a qualification course. The qualification course is designed to test the officer's ability to perform under high stress, short time limit situations. Officers must pass with a state mandated 70% minimum score to become licensed as a North Dakota Peace Officer. Active Shooter Training: An Active Shooter situation would be an incident in which a suspect(s) is actively firing weapons at innocent civilians within a building (such as a school). This training begins with the tactical approach to a location where the incident is taking place. Officers are trained on how to quickly form a four- to five-person team and move as one unit towards the structure. Once inside the location, the team of officers will use a combination of tactics to make a direct advance to the suspect(s) and quickly stop the threat. Officers are trained in these tactics using both their issued Glock pistols and the AR-15 weapon system. Defensive Tactics / Response to Resistance: The officer will attend two days of defensive tactics and response to resistance training. This training consists of pressure point controls, control and restraint holds, ground defense training, taser certification, weapon retention skills, pepper spray, and policy response to resistance regulations. The purpose of this training is to teach new officers how to defend themselves and others. The training also teaches the officer how to use their defensive tools properly and understand what actions would be necessary and appropriate in accordance with North Dakota law and Fargo Police Department policy. Newly hired officers with law enforcement skills training from outside of North Dakota or those who have worked for a law enforcement agency outside of North Dakota for at least one year must attend two weeks of basic academy at the Law Enforcement Training Academy in Bismarck, North Dakota, within one year of their hire date. At the end of this training, the new officer must pass the North Dakota POST Board Licensing exam. Topics covered by the training included North Dakota criminal and traffic law, courtroom testimony, search and seizure guidelines, building clearing tactics, and administrative DUI procedures. When a new recruit is hired by the Fargo Police Department, he or she must successfully complete the 17-week Police Training Officer (PTO) Program. While in the PTO program, the recruit rides with a PTO trainer who helps the recruit learn the procedures and policies of the Department. The PTO also helps the recruit officer apply knowledge obtained in the police academy. The Fargo Police Department has used the PTO model since 2003. The program differs from the traditional FTO program in that it focuses less on evaluating the recruit officer and focuses more on developing the officer’s problem-solving skills through problem-based learning. In the process, the officer develops the ability to deal with most situations encountered on the job. Recruit officers discover and utilize resources within the community and the Department to help solve those problems. The PTO program also uses mistakes made by the recruit as a learning opportunity. While in the PTO program, the recruit is required every day to self-evaluate his or her own performance. The recruit must also take an active role in learning by coming up with action plans to improve performance when needed. All recruits are expected to be able to apply what they have learned in the police academy and in the PTO program. Half way through the program, each recruit must successfully pass a one-week evaluation. During this evaluation, the recruit works with a PTO evaluator who assesses the officer’s performance. At the conclusion of the mid-term evaluation, a Board of Evaluators (BOE) reviews the recruit’s progress and makes a recommendation to the PTO administrators. The Board of Evaluators also ensures the PTO training team uses sound and appropriate training methods. At the end of the PTO program, each recruit must pass a two-week final evaluation. The recruit again works with a PTO evaluator, and the BOE decides if the recruit has successfully completed the program. A recruit may have his or her training extended if necessary. The ultimate goal of the program is to teach recruits the complexities of being a Police Officer and equip them to successfully work without a trainer. 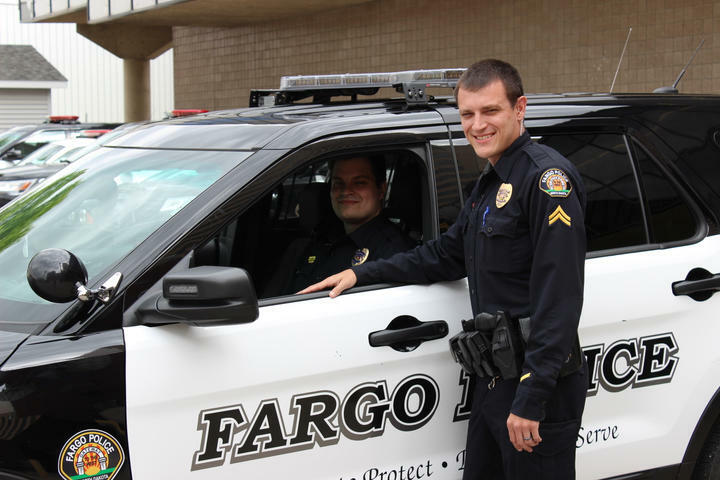 In the fall of 2015 the Fargo Police Department implemented a New Officer Mentoring program. This was designed to help new officers successfully integrate into our department by matching them with someone with a similar background and similar interests. The mentors completed a two day course on mentoring and when assigned to a new officer they help them navigate the first year of their career. Mentors are not trainers or evaluators; they are friends that help the officers understand the culture, help develop a plan so they can reach their goals, and share insight based on knowledge and experiences. The Family orientation program was also developed from the mentoring program. This program provides insight into being a spouse of an officer, and also provides the officers family with information about the benefits offered by the city to the families of our officers. The family will also meet the officers mentor and they will give them a short tour of the department buildings and where some of the city offices are located. An officer's training doesn't stop when he or she completes the police training program. Throughout their careers, officers are involved in numerous areas of in-service training. Officers train monthly rotating between firearms and defensive tactics. Officers qualify once a year with their service weapon and the carbine, and practice their skills with these weapons throughout the year with training focused on low light, shooting on the move, cover and concealment and five spot fundamental shooting. Officers also train throughout the year on defensive tactics to maintain their proficiency and include some simulated training with the F.A.T.S. program. Some in-service training is required annually, while other in-service training is designed to improve the officers skill in different areas of expertise. Officers are eligible to put in for additional training such as instructor development, intoxilyzer administration, narcotics identification, crime scene investigation, gang training, interview and interrogation skills, and any other training available to law enforcement in the region and throughout the country. One of the benefits of employment with the Fargo Police Department is the countless opportunities for personal growth and development afforded to our officers. These opportunities make the Fargo Police Department a challenging and exciting career choice.